The Chi-Athlete: What happens when you see the World through experienced eyes. What happens when you see the World through experienced eyes. My run yesterday consisted of putting one foot in front of the other, and staring at that moon. Oh. Moon. I couldn't take my eyes off of it. I also came across my running (bunny) buddy! Or at least one of them. I was slightly creeped out by the rustle of leaves, the cool air, the slight drift of fog, so I kept looking around for Michael Meyers like a cray person. But always came back to staring at that moon. This was absolutely without a doubt the highlight of my day. Just a few short miles in the eerie moonlight. I had a long day at school, then took my volleyball teams to get their booties handed to them by another team. *le sigh* That was a tough loss for them...it was a real slobber-knocker, y'all. Now I had my fair share of slobber-knockers when I played volleyball. What I noticed, as a Coach rather than a player, was that the girls KNEW the other team was better. They had matching uniform tops and bottoms (they pointed this out to me as a sign that they were more organized). Their Coaches were calm, reserved, and remained on the bench, hardly speaking a word to them. Their body language and placement on the court was more confident and advanced. My girls did nothing to combat any of these signs that they were a better team. NOTHING. They watched the ball hit the floor over and over again. They knew what to do...they just didn't. I let the game finish, then told them all in a huddle that they let them win. Literally allowed them. They knew that they were a better team, and they took it personally. What brought on this perspective? Experience. Last night was quite the shift for me, as I felt like I had a ton of experience and advice to give to girls who had no idea what to do with it. With time, I can teach them what they need to know, so I have to learn how to filter what's most important. I have enough experience in the sport to be able to reach that goal, though, because I feel like my perspective is pretty clear. In other news, I'm learning how to live with bangs. Perspective from behind bangs is a little different than without, goofy face and all. And I'd say that we're really ready for Halloween, even though none of this candy will go to Trick-or-Treat'ers. According to this, I will have a lot of work to do. Do you think that your perspective becomes more clear with experience? 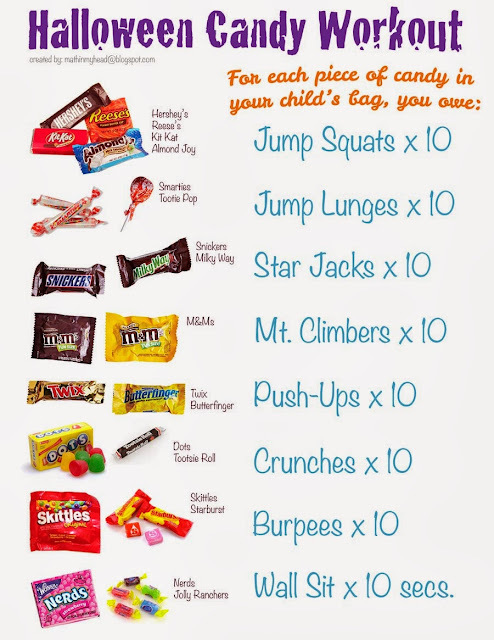 How about the Halloween candy workouts? Are you racing or do you have a fun event for this Halloween weekend? Being a coach is like being a mom--you learn that sometimes, kids need to learn the hard way because they actually can't fathom the fact that, yes, you have been there before. I also think that confidence comes with experience, and with perspective. And confidence gives you the balls to stare those big bad girls back down. It just occurred to me that I need to buy Halloween candy. I leave it out in a bowl by the mailbox self-serve style - our driveway is too long! And yes, perspective definitely changes with experience. I haven't bought our Halloween candy yet, and I need to remember to on Friday! I'm running in a 5K on Saturday afternoon. It should be fun! Thank you for linking up and sharing your perspective!